When digging into the world of content marketing, it’s easy to get overwhelmed by the 17 million hits on Google with best practices. People are definitely searching for help, and they are overloaded with data and best practices. But still, we are starving for insight. A simple search in “Soovle” reveals the top search topics on content marketing in the major search engines. I recently helped a company who just started exploring content marketing. Content marketing is linked with digital marketing, content, social media, marketing tools, and social business. So understanding what to do first can be really, really difficult. It wasn’t until the day that I decided that I needed to practice digital marketing, social media, and content marketing myself, that I really started understanding how to do this stuff. That’s why I absolutely understand what people are going through when they want to add content marketing to their marketing mix. It can be a gigantic task to oversee everything that needs to happen, and break it down into feasible steps. In the last couple of years the responsibilities of marketers has grown substantially. Today, not only you have to master building customer insight, you also need to be able to act upon that customer insight. You have new responsibilities like customer experiences, data marketing, digital transformation and social business. And these new responsibilities are on top of our existing job. The shift to online is adding more and more responsibilities to the marketing department. So I definitely understand you. The overwhelming amount of books, ebooks, blog posts and best practices are helping. But at the same time they are overwhelming. Some just take content marketing to simple, while other approaches seem just too complex. Challenges when implementing content marketing are different for small and large companies. Fully embracing content marketing, and deeply understanding it, doesn’t happen overnight. Is your content buyer centric or are you always talking about yourself ? How buyer centric your content is today? What digital marketing skills you have today? What marketing tools are you using today, and how are you using them? How you are structured to listen to ’the voice of the customer’? What processes you have today to create content assets? What type of content formats your are using today? What is your content trying to be for customers? What communication channels your are using? How well are you writing for the online world ? How is your content aligned with your buyers and their buying journey? Which type of decisions makers are your targeting? How is your digital marketing driving customers through the buying cycle? How are your call-to-actions structured to guide a customer through the buying cycle? This is not an easy job, and requires time and a lot of reflection. You could skip this step, and immediately go the pragmatic route. But I assure you, sooner or later you’ll need to answer these questions anyway. You could also outsource this job as often an external view and matter expert can open your eyes to things you didn’t see before, and speed up the process of adopting content marketing in the marketing mix. The majority of the web pages, up to 90%, where static pages, product pages, news stories and press releases. The company didn’t have recent, frequent and modern content assets like blog posts, ebooks, webinars or videos. 87% of the content was promotional, so in essence they didn’t talk about customer issues, challenges, opportunities, dreams or aspirations. 99% of the content on the website was “company centric”, instead of customer centric. Important marketing processes for contact, list and lead management where insufficiently implemented. A lack of knowledge about advanced digital marketing, content marketing and social media at several locations in the company. What type of content are you using to attract, convert and make people buy? In this case it’s promotional on all levels, while it should tilt only promotional in the buying phase. What content topics are you using across the customer life-cycle? In this example, post-sales is neglected, and the mix in awareness content is off-balance. You can also audit digital marketing best practices. In this case the “scan-ability” of the content is checked. Other usual suspects to check are the use of images, titles, call-to-actions, SEO, links, etc. 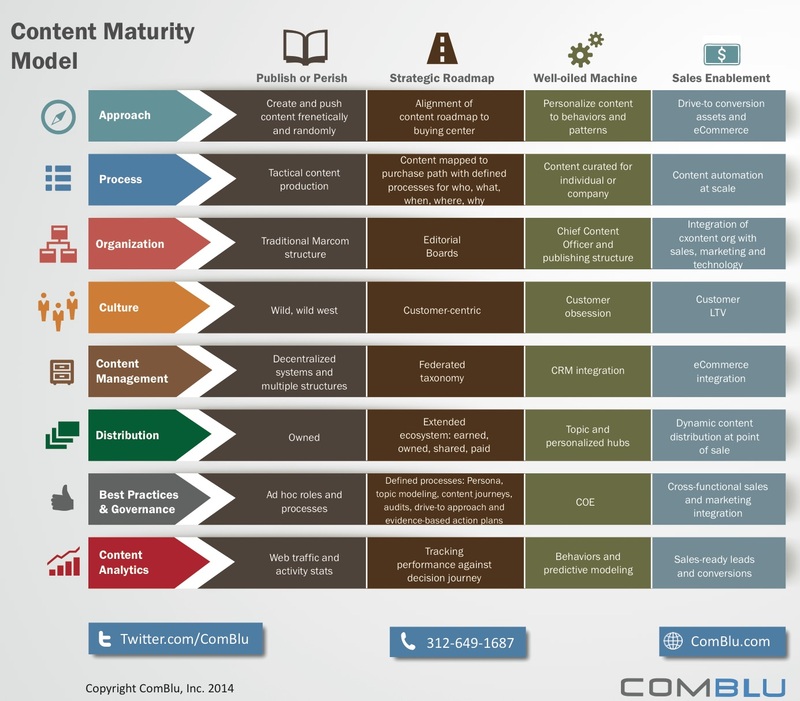 Comblu made a nice model about how they see the content marketing maturity of a company. The model is interesting because it shows you all the different blocks that you need to take care of. Depending on where you are in your journey to content marketing excellence, you’ll need to tackle different elements. And depending on the size of your company and marketing department, you’d want to take things “the pragmatic way”. Groundwork: are there things you need to do internally before you can start? this could be evangelization, defining a new organizational structure, internal communication, preparing social media strategy, new customer centric segmentation structure, etc. Content marketing strategy: do you have a strategy to translate your marketing plan into content programs that can be executed by your organization? do you understand what objectives you want to achieve with these programs? Do you know how you will be measuring the success of these programs? Organization: do you have a all processes in place for strategy creation, validation and content creation ? do you need to train people on new methods, processes, digital marketing skills, tools, etc? Tools and workflow: do you need new tools to plan, create, distribute and promote your content ? 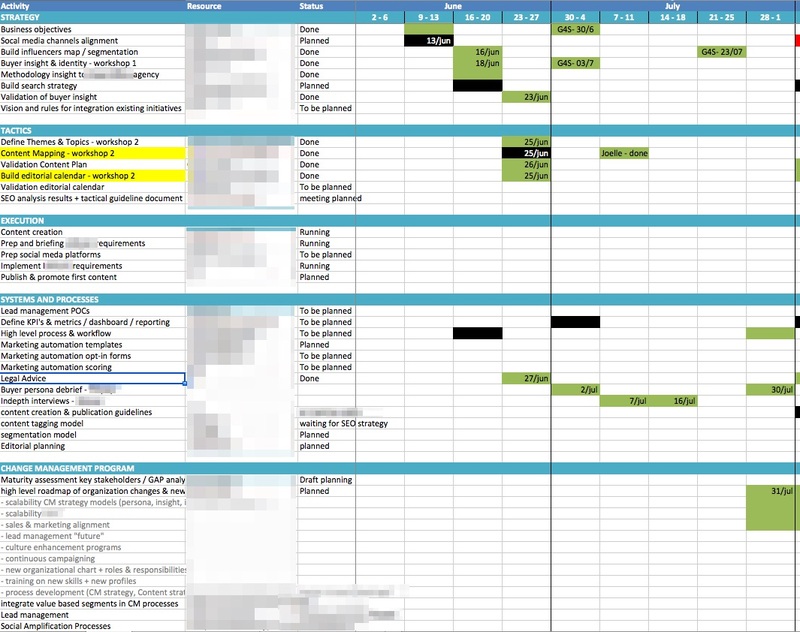 An example of an extended long-list of things-to-do-when-implementing-content-marketing. Does your management understand that buying behavior of customers have changed? Does your management understand the implications of this on marketing and sales operations? Do marketers understand the new marketing funnel? Do you have a strategy? Do you know what business objectives you have with content marketing? Do you have a structured process to listen and understand what questions customers have in each stage of the customer life-cycle? Do you need some kind of steering- or editorial board to validate the upcoming marketing calendar? Do you need extra people that drive the content culture in your organization? Are you using buyer personas or something similar? Do you understand the big ‘top-of-mind’ themes of your personas? Do you understand which keywords they are using to search? Do you know how to plan content along the life-cycle of customers? Is SEO embedded in your workflow and content assets you develop? Do you have structured process to plan, develop, publish, distribute and promote your content ? What tools are you using for researching topics, buyer insight, planning, creating, distributing and promoting content? What do you need to change on your website? Do you have a blog? Are you using marketing automation? Do you need to train your staff on digital marketing, content marketing, social media, inbound marketing, etc? Do you have people to take care of SEO/SEA/Retargetting and A/B testing? Do you have a dashboard to visualize all your content programs, related analytics, conversion rates, etc. Is your organization using social media to amplify your content? In essence, what we are doing here is building a “long-list-of-things-to-do”. Once you have your long list, start mapping them on a calendar. There’s one thing you need to realize: you want to move fast by only keeping the minimum set of things you absolutely need to do to start. Once you kick-started your content marketing strategy, you can still optimize and add other elements. Plot your roadmap into a planning sheet, only keeping the minimum of things you absolutely need to get things going on a good quality level. And there you have it: your plan to move from your roadmap towards content excellence! Don’t be overwhelmed by the amount of things that need to happen. Executing this roadmap takes time. Not only do people have to get used to “thinking buyer centric”, it also takes time to develop new organizations, skills, tools and content quality maturity. Don’t feel bad when things don’t go fast enough. Change takes time and you don’t want to rush things. This kind of change take about 1 to 1,5 years before you start feeling the benefits of content marketing. Stay tuned for more! If you liked this post, feel free to subscribe to this blog.